In various places throughout Okinawa, various annual functions are inherited now. It is feature that annual function of Okinawa has relation with various gods. We introduce entertainment to be seen in the annual function in MICHIJYUNE (parade form) in RyukyuMura. Happiness and staple grains of milk (Maitreya) people are fertile and are God who brings village prosperity. It is said that person looked up to with big round fan can find happiness. Ryukyu karate, karate that martial art of Chinese Tang fused with martial art “hand” (tea) of old martial arts Okinawa ancient times, and developed, and was born. The old martial arts using chi (eku) of tool rowing art of stick fighting and ship using personal tool are the highlight. 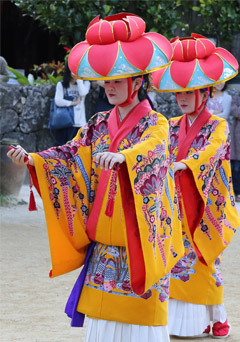 Dancers wear a hanagasa hat that resembles a lotus flower and bingata kimono. 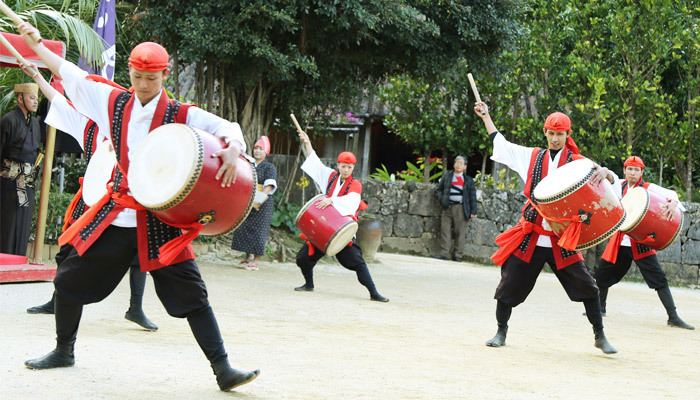 Both hands hold Ryukyu instruments called yotsudake, meaning four pieces of bamboo, which they strike together as they perform the reception dance. Guests are welcome to join in during the kachashi dance at the end of the parade.In Okinawa, kachashi means “to mix happiness” so that everyone can share the joy in the celebration. Besides, karate dances to charm dance of EISA that is traditional arts of Okinawa and powerful bu are developed! The finale of MICHIJYUNE is large serving in song and dance “kachashi” that we roll up the audience! We watch culture, entertainment of Okinawa at a time and can sense bodily! ※Program may vary according to season.